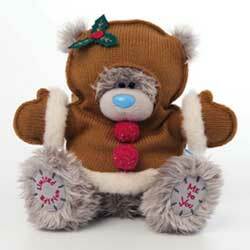 Tatty Teddy from the "Me To You" range in the UK has been with us for 25 years now. This adorable little fat grey scruffy bear has gone from strength to strength over the years and today he has even become collector's item in his right. One of the reasons behind his success is I'm, sure the little back story the company came up with to help promote the little bear. The tatty teddy bear started out life as a normal small brown teddy bear living in a normal comfortable house with a family. However one day the family moved out and the house was abandoned with all the things inside the house being thrown outside in a heap. By mistake the little brown bear was also thrown on top of this heap. The little bear was trapped under some rubbish and so could not get out and as time went on, he thought he would be there forever, forgotten and abandoned. Winter came and so did the snow and the little brown bear became sadder and sadder and colder and colder until his lovely brown fur turned grey and his little nose turned blue. One day a little girl came by and saw the bear trapped in the rubbish. She plucked him out of the pile and held him up to take a good look at him. The bear thought that she would hate him now that he was grey and rather torn and worn. But the little girl instantly fell in love with him and took him home. Patches were sewn onto the bear to repair where his fur had been torn and fallen out and although he never regained his brown fur colour, the little girl thought he was the finest bear she had ever seen. She kissed the little grey bear on the nose and said "From Me To You" and they stayed together forever. Since 1987 when the little tatty teddy bear first appeared, he has changed slightly in design over the years. The brand has also increased to include other animals that also sport the little blue nose. As you can see from this picture, the little bear first appeared brown in colour and slightly less stout. It wasn't until the "Me To You" brand and story was born that the little bear began to appear full time as we know him today with his little blue nose and grey tatty fur. Although there have been many different products over the years which have been released as Limited editions, I want to concentrate on the plush toy. 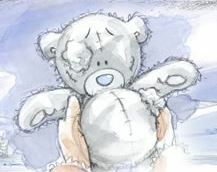 The Plush toy tatty bear first appeared in 2000. At this time a few bears were produced in the original brown colour, these are now very rare and sought after by collectors. Since then the little bear has appeared in many guises but the most popular amongst collectors are those which appeared as a limited edition. Often limited editions were brought out to celebrate certain sporting events like the world cup. Recently a set of bears have appeared to celebrate the recent London Olympics, with bears appearing in swimming costume and boxing gear. Some limited editions are brought out to celebrate certain times of the year such as Xmas, Easter and summer. With these bears dressed as Santa, an Easter bunny or sporting sun glasses. 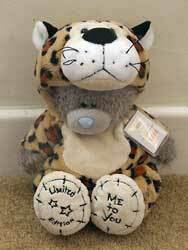 See my Me To You Tatty Teddy Limited Editions For Sale. 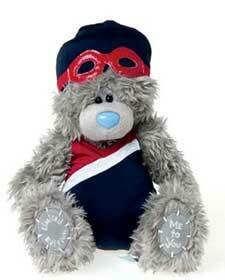 From time to time I come across some rare tatty teddies and I sell them online here.